The 5-inch BlackBerry Z30 release date has been announced (it's September 27), although you'll only be able to pick it up from Selfridges on that date. If you're tempted to run out and grab a Z30 you'll need to take £529 with you for the SIM-free handset, or you can pick yourself up one for free on a two year contract starting at £32 per month. O2 and Vodafone tariffs will be available from Selfridges, although we're told the BlackBerry Z30 will also be coming to EE at a later date. 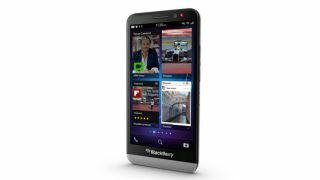 There's good news for 4G fans, as the BlackBerry Z30 supports the superfast networks of all the major UK carriers. If you don't fancy dragging yourself to Selfridges then you'll also be able to go to Carphone Warehouse from September 30 for a Z30, or Vodafone from sometime in October. Make sure you keep an eye out for our hands on BlackBerry Z30 review, which will be online soon.